Copper engraving of a maritim scenery. Galley, Bucentaur, Bucintoro, Venice, Venezia. Printed in Nuremberg by Johann Ernst Adelbulner in 1718. Comic map on a postcard with war propaganda published during the first months of World War I.
Map of World War One, Propaganda Map. Printed in Munich by Verlag Hermann Bercker in 1914. A symbolic description of the tropics. Printed in Paris by Nicolas Chesneau, Michel Sonnius in 1575. Old coloured jigsaw puzzles. Printed in Paris in the year 1820. Beautiful coloured woodcut of sea and land monsters. Published by Heinrich Petri and printed in Basel in 1574. Old coloured map of Cockaigne, Utopia. Printed in Augsburg by G. M. Seutter circa 1730. Wind map in stile of a wind rose. Original old colouring by the publisher. Old coloured wind map. 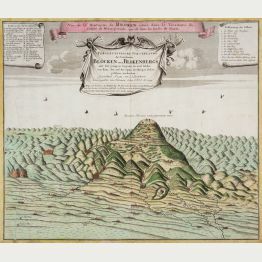 Printed in Augsburg by T. C. Lotter circa 1760. Coloured woodcut of seamonsters of the 16th century. Published by Seb. Munster in Basel during the year 1550. Copper engraving of a military scene. Printed in Nuremberg by J. B. Homann circa 1720. A palimpsest with first hand writing partly erased from around 1100. On top of it, a Gothic script from around 1300. On parchment which was formerly used as part of a book cover. Manuscript on parchment written during the 12th and 14th century. Hand coloured copper engraving of Matthaeus Seutter. Showing large round calendar. Old coloured engraving of a calendar. Published in 1720. Engraving of a compass rose and an armillary sphere. Published by E. Bowen in London during the year 1747.